Don't you just love these little choir boys?! I had a lot of fun coloring them. 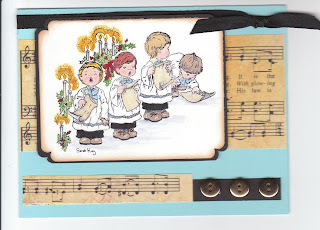 I remembered having this muscial paper in my stash from a long time ago and just had to use it on this card. Alas, this is the last of it and will have to go find more ... it certainly adds to a lot of cards ... especially this stamp set which I must use again! Thank you for stopping by to see my blog and come again real soon. Love your card!!! Would you mind telling me where you got this adorable stamp? That ^ up there ^ is from Edison...he's sitting next to me. Love this, it reminds me of the Christmas Carol book we used to have. Actually, I think I still have it! Such a sweet, sweet card! Love that sheet music paper!